(March 29, 2019) Michael Bublé&apos;s world tour, An Evening With Michael Bublé, in celebration of his 10th studio album, # (Love), marks the singer’s long-awaited return to touring after a two-year hiatus. It is a huge production with an intense schedule, with 12 performances already taking place in just the first two weeks of the tour. The inaugural show opened at the Amalie Arena in Tampa Florida on 13 February 2019, from where it will continue, travelling in 20 trucks, to large arenas throughout North America until April, then on to Canada, Europe and Australia later in 2019, and onward into 2020. The show has a &apos;big band&apos; feel to it and the elegant set, designed by international entertainment architects, Stufish, provides a stylish backdrop for the Canadian crooner. 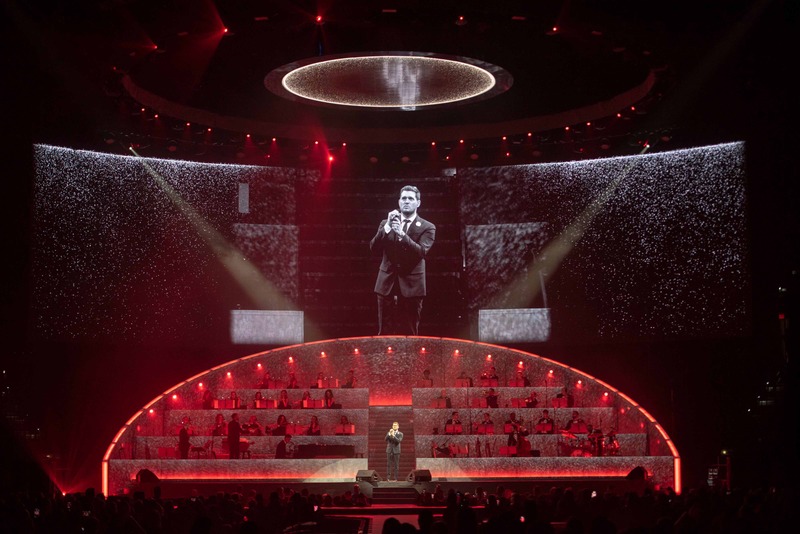 "It&apos;s all aimed to focus on the man and his music," explains Bublé&apos;s long-term show and lighting designer, Kurt Wagner, who has worked with Bublé for the past 14 years. "Michael likes a good production, but he is such a great entertainer and singer in his own right that we don&apos;t need a lot of effects and distraction in the show. The design style is very much to paint a picture around him with some dramatic set pieces and, mainly, static lighting. Our aim is to create a beautiful frame that presents Michael back to his audiences in a production that puts the accent firmly on his music." The lines of the set are clean and sophisticated with cool, light grey colour tones and a brushed cement-type finish which, Wagner says, is &apos;a great surface on which to paint with light and projection&apos;. Central to the main set is an expansive elliptical area seating 38 musicians on four levels on either side of a central staircase, backed by a semi-circular wall that echoes the curves of the other set elements. Into the upper section of this wall Wagner has embedded 23 Ayrton MagicDot-SX fixtures. "The intent was to have some small lighting fixtures that could be built into the set and used to outline it and delineate its sweeping curves`" says Wagner. "The MagicDots have proved the perfect unit for this and given me a lot of flexibility in creating different looks to frame Michael." "The nature of the show means we are aiming less at dynamic effects and more at creating a variety of beautiful static states as backdrops. I&apos;ve therefore concentrated on using the MagicDots as filler and framing lights and they have given me many interesting options to create structure and fill in gaps between the height of the truss and the lower level lights." "The zoom capability is one of the biggest features on this little fixture and it has impressed me the most. It has allowed me to work within the tight confines of the set which restricts their left-to-right movement a little, yet still use the zoom and colour functions to achieve a lot of different looks - more than I was expecting. Plus the colours are very rich and solid, especially for an LED source, so I am very happy." To extend the &apos;frame&apos; further overhead, Wagner has added 18 more MagicDot-SX units in the upstage truss to increase the depth and add to the mid-air effects. "I am most impressed with the intensity of the MagicDot-SX which has a lot more punch than I expected, especially considering its diminutive size. The upstage lamps are trimmed at 48&apos; and the MagicDots still register well on stage. For the size of the fixture it is very, very impressive." This is the first time Wagner has used Ayrton fixtures and his experience with MagicDot-SX has been very positive. "I went to my regular supplier, Christie Lites, wanting a small fixture with plenty of punch and a good, large zoom capability that was small enough to fit into the holes in the set. Iâ€™ve used Christie Lites for a long time because I like their products and how they service their gear. They are extremely professional and I trust their judgement, so when Ian Gordon, my account rep, brought the MagicDot-SX to my attention, I was keen to try it. We tested them against several other fixtures and the MagicDot-SX definitely gave the best output of all." "The main selling points for me were the combination of the MagicDot-SX&apos;s size and output: they are small enough to fit into the set and very functional even within the restricted space; I was really happy with the zoom capability and there are not many lamps that would give me that punch at that size." With only two weeks of pre-production and four or five days of intensive programming before hitting the road, Wagner says they have not yet had time to explore the full capabilities of what the MagicDot-SX can do, "but once the show has had time to bed in, we will have some fun finding out what else we can get out of them. But the programming was easy with no concerns or issues, so my team was very happy." After two and a half weeks on the road, traveling from the heat and humidity of Florida to the cold and snow of New York, the MagicDot-SX units have proved as reliable as their reputation with no replacements needed..."which is always a good sign after the rough roads of New York state!" agrees Wagner. "This show is set to last for two years and the production we have now will travel with us all over the world, with the same set and the same lighting fixtures being shipped to each continent, so we will be able to truly test the durability and reliability of the MagicDots after that. So far the indications are very good!" Michael Bublé&apos;s Love tour will continue its North American and Canadian leg until April before hopping the Atlantic to the UK from April to June, and back to the USA and Canada for July and August. The main European leg will commence in September, ending 2019 in Munich on 10 November. A leading importer and distributor of lighting products, A.C.T Lighting, Inc. strives to identify future trends and cutting-edge products, and stock, sell and support their inventory. The company provides superior customer service and value to all of its clients. For more information call (818) 707-0884. Text: Julie Harper Photos: © Ric Lipson, Stufish.